There were several studies on the prevalence of epilepsy in India,  Most of them are from south India and only few studies were from northern states. ,,, The meta-analysis by Sridharan and Murthy reported a prevalence rate of 5.33 (95% confidence intervals (CI) 4.25-6.41) per 1000 population. The reasons for the vide variations in the prevalence rates reported in these studies are not clear. Most of the earlier epidemiological studies were not supported by investigation like computed tomography (CT) scan and electroencephalography (EEG) to establish the etiology of epilepsy. In a recent study in south India, a third of active epilepsy was related to neurocysticercosis. One hospital-based study in north India had also suggested that a good proportion Of recurrent unprovoked seizures were due to neurocysticercosis (NCC). Thus it quite possible that in certain geographic regions NCC may be contaminating the prevalence rates of epilepsy. Uttarakhand is the youngest state in India and a large portion of the state is covered by hills of Himalayas. Medical service infrastructure is poor and the economic status of the population is very poor. One pilot study indicated a high prevalence rate of NCC in Uttarakhand state. This study was aimed to study the prevalence of active epilepsy and also to find out the proportion of active epilepsy related to NCC in one block of Dehradun district of the Uttarakhand state. This community-based cross-sectional study was conducted in Chakrata block of Dehradun district in Uttarakhand. The study was done in two phases. The first phase was questionnaire-based door-to-door survey to detect possible cases of epilepsy and the second phase included case ascertainment by a neurologist. The selected Chakrata block of Dehradun district has the lowest composite block index (CBI) among the six blocks of Dehradun district. Chakrata block is about 80 km from Dehradun at a height of 6000−7000 ft above the sea level. Total area of the block is 144.33 km 2 . Basic unit of the block is Nyaya Panchayat (NP) and this block is divided into nine NP. Sample population from this block was selected in a way that it should represent entire population of Chakrata block. All 152 villages from nine NP were sorted in ascending order of population. Four villages from each NP were randomly selected on the basis of population size. Finally, 36 villages were randomly selected to cover about 14000 (25%) population. Thirty-six community health workers (CHWs) were appointed to cover all the selected villages. In addition, two medical officers (medical graduates) were appointed to supervise CHWs. All the staff was trained for a week at our institute on survey techniques, orientation to seizure disorders, method of interview, and recording of data. The medical officers were specially trained in epilepsy evaluation and its epidemiological classification. Primary data was collected through a door-to-door interview using a questionnaire developed by Gourie-Devi et al., and subsequently adopted by ICMR. This questionnaire was converted to easily understandable language for easy application in the selected population. All households in the selected 36 villages were interviewed by the team of field workers and one medical officer. All cases having high possibility of seizures on initial survey were subsequently evaluated by neurologist. The CHWs were responsible to bring the persons with positive response to the neurologist for further evaluation. Neurologic evaluation was aimed at establishing the true nature of seizure disorder and whether the seizure disorder was active or in remission. The population studied was 14,086 in 1671 households in 36 villages. Children accounted for 28.3% (3991) of the population. Gender distribution was 53% male and 47% female. The population belonged predominantly to Hindu religion (99.3%) and people with Muslim religion accounted for only 0.7%. Major occupation of the people was agriculture in 90.8% families. Average monthly income of index population was INR 1957 per household. Almost all people (99.3%) were native resident of village since birth. Nearly 301 (18%) families had more than six occupants per room. Only 11.3% houses had in-built toilet facility and 42% families were using soil or ash for hand washing. Almost all resident were predominantly non-vegetarian by diet. Only 2.25% of families were using hospital for childbirth and almost 46% children had full immunization according to the national program. Total 66% of families preferred government hospitals for the emergency medical management. After first phase of door-to-door survey of 14086 people, 152 persons had event suggestive of afebrile seizures. The neurologist of the team screened all 152 cases at community health centers and diagnosed psychogenic non-epileptic seizures in nine and neurocardiogenic syncope in one. Of the remaining 142 cases, 141 had two or more unprovoked seizures in the last five years and one person had a single seizure, giving a crude prevalence rate of 10 per 1000 population. Generalized tonic-clonic seizures (GTCS) were the most common type in 76 (53.9%) cases. Only 41 (29%) had ever used allopathic medicine, rest 100 (71%) were using either local remedies such as worship, traditional healing methods or alternative medicines [Table 1]. Of the 141 patients who underwent contrast CT scan and EEG testing, 35 (24.8%) had definitive diagnosis of NCC with active cysts and 14 (9.9%) patients had possible NCC with calcified granuloma. Of the 49 patients having neurocysticercosis, 47 (95.9%) had solitary lesion and 2 (4.1%) had multiple lesions. Other symptomatic etiology was gliotic lesion in 22 (15.6%) patients due to old trauma, brain surgery, birth injury, or cerebral infarction. Eleven (7.8%) patients had EEG findings suggestive of idiopathic generalized epilepsy. Rest of the 59 (41.8%) patients had no specific etiological diagnosis or identifiable epilepsy syndrome. Three specific etiologies (acute, remote symptomatic and idiopathic generalized) could be identified in 82 (58.2%) patients after investigations. Most prevalent etiology was NCC (active + inactive), followed by gliotic scar-related epilepsy. The crude prevalence of acute symptomatic seizures related to NCC was 2.5 per 1000 population. The crude prevalence of remote symptomatic epilepsy (gliotic and calcified CT lesions) was 2.5 per 1000 population. 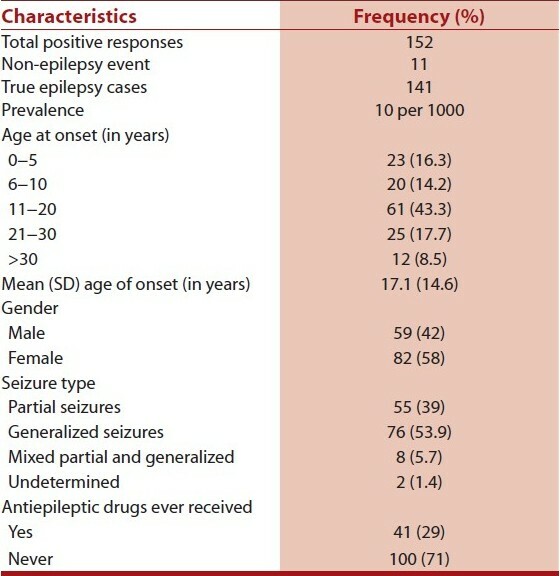 Rest of the patients had either unclassified or idiopathic epilepsy [Table 2]. After excluding acute and remote symptomatic cases related to NCC, crude prevalence rate of epilepsy was 6.5 per 1000 population. In this population the calculated crude prevalence of epilepsy (two or more seizures) before the neuroimaging was 10 per 1000 population. However after excluding patients with seizure disorders associated with both acute symptomatic seizures associated with active stage of NCC and unprovoked seizures associated with calcific stage of NCC, the crude prevalence of epilepsy was 6.5 per 1000 population. We have not calculated age and gender specific prevalence rates. Seizures associated with degenerative phase of NCC are misdiagnosed as unprovoked seizures as often these patients will not have focal deficits and history of any antecedent events. The diagnosis can only be established by neuroimaging. Both acute symptomatic (degenerative phase) and unprovoked (remote symptomatic - calcific stage) seizures associated with NCC were found in about one-third of the patients. Causal relationship between seizures and calcific CT lesion is debatable and the lesion on CT can be incidental. In the Vellore study in south India, one-third of the patients had active epilepsy related to NCC and the prevalence of active epilepsy in was 3.83 per 1000 population,  which is much less than the reported prevalence rate (5.33 per 1000) in the metaanalysis by Sridharan and Murthy. In the epidemiological study from Kerala where NCC is virtually non-existent the reported prevalence of active epilepsy was 4.7 per 1000. Some of the excess in the prevalence rates reported from different parts of the country may be related to the contamination of cases of seizure disorder associated with NCC as seen in our country. The high frequency of NCC in the Uttarakhand State may be due to poor water sanitation and non-vegetarianism of the large segment of the population. In the population studied only a small proportion of people are pork eaters. Implementation of an effective preventive program for NCC in a non-pork eating population is much more difficult. This is a major challenge for people working in this field as prevention of NCC can lower the burden of epilepsy by one-third in some of the geographical areas of India. We extend our thanks to Indian Council for Medical Research (ICMR), New Delhi, for providing all the financial support for this study and co-operation for all needful during the project. 1. Sridharan R, Murthy BN. Prevalence and pattern of epilepsy in India. Epilepsia 1999;40:631-6. 2. Sureka RK. Clinical profile and spectrum of epilepsy in rural Rajasthan. J Assoc Physicians India 1999;47:608-10. 3. Sawhney IM, Singh A, Kaur P, Suri G, Chopra JS. A case control study and one year follow-up of registered epilepsy cases in a resettlement colony of North India, a developing tropical country. J Neurol Sci 1999;165:31-5. 4. Singh A, Kaur A. Epilepsy in rural Haryana--prevalence and treatment seeking behaviour. J Indian Med Assoc 1997;95:37-9. 5. Koul R, Razdan S, Motta A. Prevalence and pattern of epilepsy (Lath/Mirgi/Laran) in rural Kashmir, India. Epilepsia 1988;29:116-22. 6. Rajshekhar V, Raghava MV, Prabhakaran V, Oommen A, Muliyil J. Active epilepsy as an index of burden of neurocysticercosis in Vallore district, India. Neurology 2006;67:2135-9. 7. Mohanty S, Deb M, Aggarwal P. Neurocysticercosis in a north Indian hospital. Trop Doct 2008;38:177-9. 8. Varma A, Gaur KJ. The clinical spectrum of neurocysticercosis in the Uttaranchal region. J Assoc Physicians India 2002;50:1398-400. 9. Gourie-Devi M, Gururaj G, Satishchandra P, Subbakrishna DK. Neuroepidemiological pilot survey of an urban population in a developing country. A study in Bangalore, South India. Neuroepidemiology 1996;15:313-20. 10. Guidelines for epidemiological studies on epilepsy, Commission on Epidemiology and prognosis, International League against Epilepsy. Epilepsia 1993;34:592-6. 11. Del Brutto OH, Rajshekhar V, White AC Jr, Tsang VC, Nash TE, Takayanagui OM, et al. Proposed diagnostic criteria for neurocysticercosis. Neurology 2001;57:177-83. 12. Razdan S, Koul RL, Motta A, Kaul S, Bhatt RK. Prevalence and pattern of major neurological disorders in rural Kashmir (India) in 1986. Neuroepidemiology 1994;13:113-9. 13. Mani KS, Rangan G, Srinivas HV, Kalyanasundaram S, Narendran S, Reddy AK. The Yelandur study: A community-based approach to epilepsy in rural South India--epidemiological aspects. Seizure 1998;7:281-8. 14. Das S, Sanyal K. Neuroepidemiology of major neurological disorders in rural Bengal. Neurol India 1996;44:47-58. 15. Garg RK. Neurocysticercosis. Postgrad Med J 1998;74:321-6. 16. Leite JP, Terra-Bustamante VC, Fernandes RM, Santos AC, Chimelli L, Sakamoto AC, et al. Calcified neurocysticercotic lesions and postsurgery seizure control in temporal lobe epilepsy. Neurology 2000;55:1485-91. 17. Radhakrishnan K, Pandian JD, Santhoshkumar T, Thomas SV, Deetha TD, Sarma PS, et al. Prevalence, knowledge, attitude and practice of epilepsy in Kerala, South India. Epilepsia 2000;41:1027-35. Trung, D.D. and Praet, N. and Cam, T.D.T. and Lam, B.V.T. and Manh, H.N. and GabriÃ«l, S. and Dorny, P.
MeÅ¡troviÄ‡, T. and Sviben, M. and VilibiÄ‡-ÄŒavlek, T. and Ljubin-Sternak, S. and Tabain, I. and MlinariÄ‡-GalinoviÄ‡, G.
Newton, C.R. and Garcia, H.H. Brunetti, E. and White, A.C.
Kvalsund, M.P. and Birbeck, G.L. Gursahani, R. and Gupta, N.
22 Cysticercosis of the central nervous system: How should it be managed? Garcia, H.H., Gonzalez, A.E., Gilman, R.H.